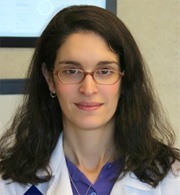 Catherine V. Laiosa, M.D. graduated from Rutgers College with a Bachelor’s in Molecular Biology and Biochemistry and was elected to Phi Beta Kappa. She completed a combined MD/PhD degree from Albert Einstein College of Medicine. Her research focused on the development of lymphocytes from hematopoietic stem cells and she published several articles in prominent immunology journals. She completed her residency in Internal Medicine at Mount Sinai. As a resident, she won multiple awards related to patient care and education including the Richard Gorlin Award for Resident Humanitarianism and Arnold P. Gold Foundation Humanism and Excellence in Teaching Award. She also completed a fellowship in Palliative Medicine at Mount Sinai. Palliative care focuses on symptom management, advance care planning and decision making for patients with chronic medical conditions including cancer, dementia and end-stage organ disease. She practices internal medicine.